this series of classes exposes dancers from 18 months to 6 years old to the magic of ballet that we are so passionate about. tippy toes (18 months - 3 years old) | expose your little one to the magic of dance and enjoy the memories you create through sight, sound and movement. your child will start to learn ballet terminology and basic dance movements with puppets, musical instruments, props, bubbles & gross motor skill development games. 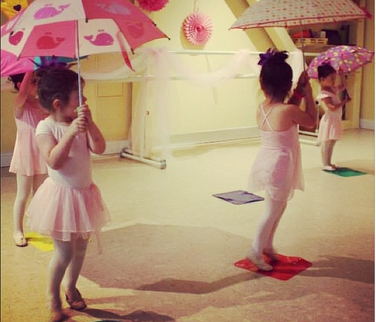 pre-ballet (3 - 4 years old) | introduces your child to ballet & proper studio etiquette while focusing on coordination & motor skill development. students will work on flexibility & body awareness through stretching & free dance. pre-ballet II (5 - 6 years old) | focuses primarily in first and second position to learn correct form and studio etiquette. we explain key foundational ballet terms & techniques (plies, tendus, degages, rond de jambe & grande battemante) in ways that are memorable (and make sense) to our students. dancers also learn travel movements across the floor. kids yoga (4 - 7 years old) | Children are introduced to yoga poses and breathing techniques through movement, music and games. Each class is focused on a theme to help children build a connection to yoga, and begin to develop social, emotional, and self-regulation skills. Class begins with either a centering or tie-in activity and closes with a relaxation. for a more classical approach, we offer a series of traditional classes for dancers with a unique passion for ballet from an early age. we recommend two classes per week. no previous dance experience needed. ballet I (6 - 7 years old) | students will perfect their posture & technique, explore the art of balance, master their flexibility & learn various jumps and combinations. peer performances will also be introduced. ballet II ( 8 - 12 years old) | covers the fundamental ballet techniques in a more formal studio setting, focusing on discipline & maturity as dancers advance to the next level. strength, flexibility, rhythm, musicality & memorization will be stressed. students will also learn basic performing & choreography skills. I have two favorite things about miss lauren's classes: first that the correct ballet language is used, not made-up cute terms. second, that they perform almost every class. performing/presenting in public is an important skill needed for the rest of their lives.